The action is hot and heavy on the S-curves at Elizabeth, NJ as a northbound "Jersey Builder" running express on the outside track overtakes a long Penn Central freight grinding north behind two big E-44's. The northbound CNJ train originated in Long Branch and after making all the stops up the Jersey shore along the way to New Brunswick, the GP40P on the point is making a quick run up the corridor to the termination point for the train in Newark NJ. There the passengers will transfer to an electrified Penn Central commuter train for the final few miles under the Hudson River to Penn Station, NYC. 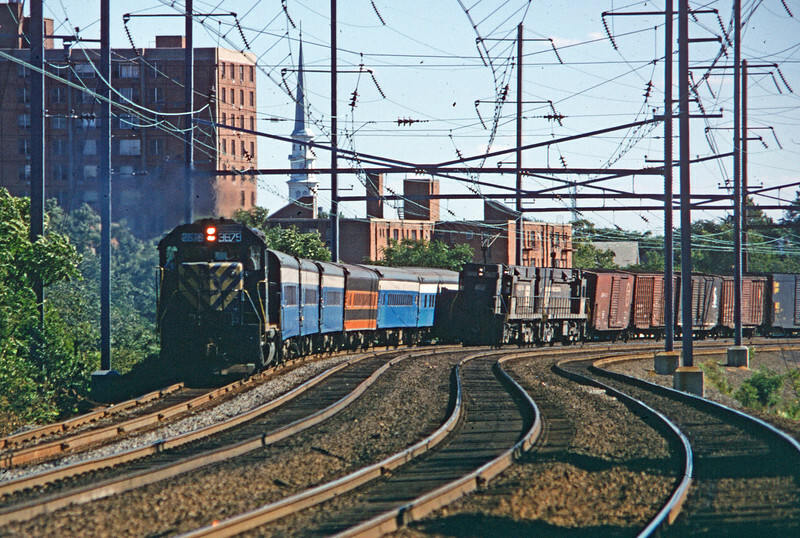 The fans nicknamed these trains Jersey Builders after the famous Great Northern "Empire Builder" when the former GN passenger cars were acquired to update the service. While most of the cars are painted GN "Big Sky" Blue, one car remains in the original Great Northern colors.